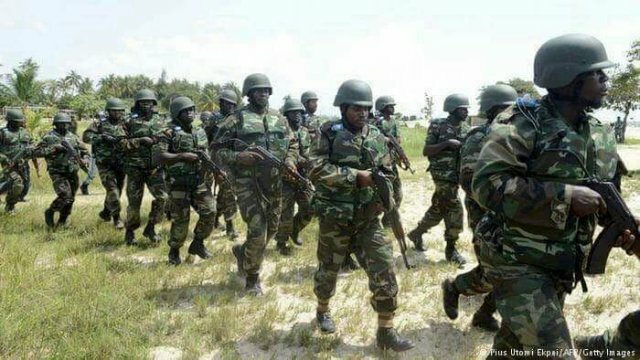 NNEWI—THE Nigerian Army yesterday said it will soon commence its annual training programme, the ‘Operation Python Dance III’, also known as Exercise Egwu Eke III, in South East States formations and units under 82 Division, Nigerian Army. This was disclosed yesterday by the General Officer Commanding, GOC, 82 Division Nigeria Army, Maj. Gen. Emmanuel Boman Kabuk, at the 302 Artillery Regiment, (General Support) Onitsha, Anambra State, when he paid a familiarisation visit to the military cantonment, having resumed duties in Enugu on August 6, 2018. The Nigerian Army therefore urged all law abiding citizens of the country, particularly the people of South East to go about their legitimate, lawful and genuine businesses, saying that “those afraid of the exercise are criminal elements that do not want their activities checked and are just being afraid of the consequences of their heinous criminal actions.” Maj. Gen Kabuk , who was accompanied by some senior Army officers from 82 Division, was led round the Onitsha military cantonment for inspection of equipment and facilities by the Commander, 302 Artillery Regiment, General Support, Col. Idongesit Akpan. …warns pro-Biafra agitators He warned that the Nigerian Army will not tolerate any distraction or trouble from any group including the pro-Biafra activists and killer herdsmen in the South East, before, during and after the exercise, saying that they will ensure that law abiding citizens in the zone and Nigeria in general live in peace. “The Army trains on daily basis and at times, as a group annually, so Exercise Egwu Eke, from the beginning was Python Dance I. We changed it to Egwu Eke to align with the environment which is the South East, still referring to it as Python Dance II and so, we are now saying that Exercise Egwueke III is going to hold. It is still going to be a training exercise. “Whenever Exercise Egwueke is mentioned, people always think the Army has come to do some dangerous things in the South East. It is a wrong impression, it is a training exercise, but I must tell you that the people that get afraid are criminal elements who are looking for cover in their crimes. “We want to let Nigerians know that if we are training, we are training to defend the territorial integrity of Nigeria.